Here in this class we are going to discuss some Profit and Loss questions answers which were previously asked in Government jobs competitive exams. This maths class in specially designed for the Profit and Loss chapter!! For better results you can make notes or you can bookmark our website for future reading > www.Coaching123.in ! Q. Raju wanted to sell an cooler with 20% profit, but he actually sold it at 20% loss for Rs.480. At what price he wanted to sell the cooler to earn the profit ? Q. 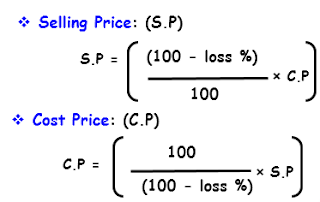 If the selling price of 10 apples is equal to the cost price of 12 apples; then the profit percent is ? Q. A girl sold two cars for Rs.28560 each. On one she gains 15% and on the other she losses 15%. Find her loss or gain percent in the whole transaction ? Q. Rajesh sells a bicycle to Sumit at a profit of 20%. Sumit sells it to Anuradha at a profit of 25%. If Anuradha pays Rs.225/- for it, the cost price of the bicycle for Rajesh is ? Q. If Shamu sells 12 copies of book for Rs.1800 and gains cost price of 3 copies. The cost price of a book is ? Q. A table is bought for Rs.750 and sold at a loss of 6%. Then find its selling price ? Q. If Ravinder estimates his loss as 20% of the selling price. Then Ravinder's loss percent is ? Q. If your brother have purchased 11 pens for Rs.10 and sold all the pens at the rate of 10 for Rs.11, then your brother's profti percent is? Q. John buys a table for Rs.1400 and sells it in a market at a loss of 15%. What will be he selling price of the table ? Q. If the ratio of CP and SP is 5:4. Then the loss percentage is ? Q. IF Raghu buys some pens at 5 for a rupee and sells those pens at 3 for a rupee. Thne Raghu's gain percent is ? Q. 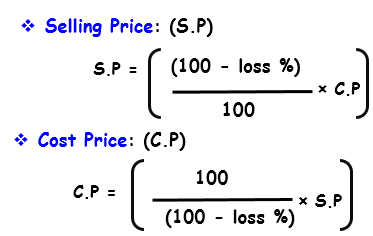 If the SP of a table is 8/5 times its CP, then the profit percent of the table is ? Q. If the price of sugar is increased by 20% then by what percent Ramu's family should decrease the Sugar consumption so that the expenditure remains the same ? Q. A discount of 20% in the price of Sugar enables Sunita to obtain 4 kg more Sugar for Rs.100. The reduced/discounted price of the Sugar per kg is ? Q. Anjali sells her cycle at a profit of 10%. If she had bought the cycle at 5% less cost and sold for Rs.80 more, she would have gained 20%. The CP of the cycle is ? Q. A lady had 100 kg of Salt part of which he sold at 7% profit and rest at 17% profit. She gained 10% on the whole transaction. How much did she sell at 7% profit ?